With summer temperatures luring us outdoors, scientists with the Weed Science Society of America (WSSA) say it’s a great time for refresher course on poison oak, poison ivy and poison sumac. All three thrive during summer months and are known to trigger highly irritating skin rashes that can last for many days. Poison ivy is found nationwide, with the exception of Alaska, Hawaii and some portions of the western coastline. Each leaf includes three glossy leaflets that vary in color (and sometimes shape) throughout the year – red in spring, green in summer and yellow, orange or red in the fall. It can grow as a shrub or as hairy, ropelike vines sometimes seen growing up the sides of trees. Fiction: Only the leaves are toxic. Fact: All parts of the plants can trigger an allergic response, including the leaves, roots, flowers, berries, stems and vines. Fiction: The painful rash can be spread through watery fluid found in blisters. Fact: Only exposure to the oily toxin urushiol will trigger a reaction – not the fluid in blisters. Rashes often emerge over a series of days, though, which can make it seem as though they are spreading as blisters ooze. Fiction: If you don’t touch the plants directly, you’re in the clear. Fact: Toxic oils can linger on clothes, gardening gloves, tools, shoes and even pet fur – producing a skin rash just as if you touched the plant yourself. Wash your tools, clothing and pets regularly, especially after an exposure. The oils can remain potent for months and even years. Fiction: You can dispose of poison oak, poison ivy and poison sumac just as you would any other weed. Fact: It is important to take great care in disposing of plants that you pull, mow or dig. You don’t want yourself or others to be exposed to oily toxins that remain. Be especially careful to never use burning as a disposal strategy. Inhaling the smoke can cause a whole-body reaction. Fiction: There is nothing I can do to avoid a rash if I’ve touched poison oak, poison ivy or poison sumac. Fact: You may be able to avoid a rash or reduce its severity by pouring rubbing alcohol over the exposed area as soon as possible and washing with running water. Clinical tests show that dishwashing detergent is also effective at removing the rash-causing urushiol toxin. Fiction: Some people are simply immune to urushiol-induced rashes. Fact: While it is true some individuals are not bothered by a rash, sensitivity to urushiol can develop at any time. Once you’ve had a rash, you can become more sensitive and have a stronger allergic response the next time you are exposed. 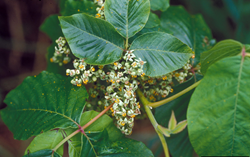 For more information about poison oak, poison ivy and poison sumac, visit http://www.cdc.gov/niosh/topics/plants. The Weed Science Society of America, a nonprofit scientific society, was founded in 1956 to encourage and promote the development of knowledge concerning weeds and their impact on the environment. The Society promotes research, education and extension outreach activities related to weeds, provides science-based information to the public and policy makers, fosters awareness of weeds and their impact on managed and natural ecosystems, and promotes cooperation among weed science organizations across the nation and around the world. For more information, visit http://www.wssa.net. Today there are several options for control – and more may be on the horizon. Much to the chagrin of gardeners, hikers, and virtually anyone enjoying the outdoors, one of the hazards of summer is picking up an itchy poison ivy rash. But researchers in the Virginia Tech College of Agriculture and Life Sciences have found an effective way to kill poison ivy using a naturally occurring fungus that grows on the fleshy tissue surrounding the plant’s seed, potentially giving homeowners and forest managers the ability to rid landscapes of the pernicious pest. Their findings could make the maddening itch of the summer season a thing of the past for the untold millions who are allergic to the plant. The study was published this week in the journal Plant Disease and is a first of its kind on a plant that affects millions but has had surprisingly little research done on it. John Jelesko, an associate professor of plant pathology, physiology, and weed science, began studying the plant after experiencing a nasty poison ivy rash himself while doing some yard work. Much to his surprise, there was scant research focused on the plant itself. Most of the work was centered on urushiol, the rash-causing chemical found in the plant’s oils. Urushiol is extremely potent. Only one nanogram is needed to cause a rash, and the oil can remain active on dead plants up to five years. But rather than focusing on urushiol, Jelesko set about studying ways to kill the plant itself. He worked with Matt Kasson on the project, a senior research associate in the same department. Their work is especially valuable in light of the fact that a 2006 study showed that as the planet warms, poison ivy is predicted to grow faster, bigger, and more allergenic, causing much more serious reactions that could send an increasing number of people to the doctor for prescription medications. 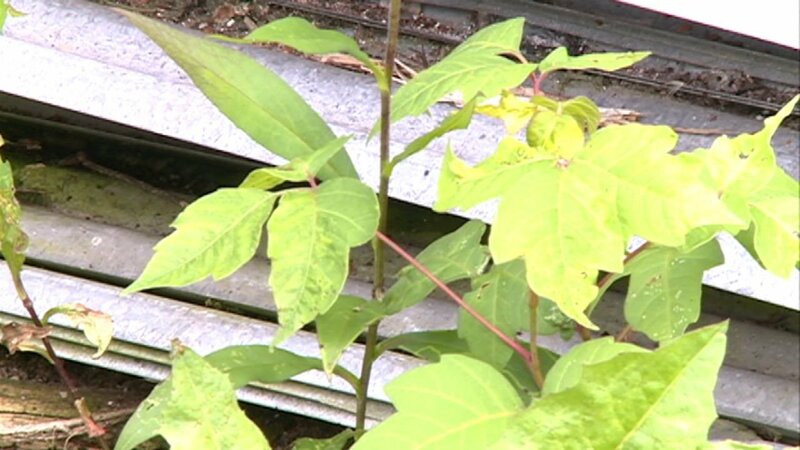 “When poison ivy can’t be treated with over-the-counter treatments and requires an outpatient visit, then we are talking about a public health concern that is very real,” said Kasson. The research team discovered the killer fungus in their initial attempts to generate microbe-free poison ivy seedlings to use in their studies. Jelesko noticed that not only were some of the seeds failing to germinate, but on the seedlings that did germinate, there was a blight wiping out the young seedlings. Jelesko enlisted the help of Kasson to isolate what he suspected was a fungus causing disease in the plants. The team discovered that the fungus was growing on all the plants that died and the seeds that didn’t germinate. The fungus caused wilt and chlorophyll loss on the seedlings just by placing it at the junction of the main stem and root collar of the plant at three weeks post-inoculation. At seven weeks post-inoculation, all but one of the plants had died. Though herbicides are available to kill poison ivy, Jelesko and Kasson said that if this fungus were developed into a commercial application, it would not only be more effective than its chemical counterparts, but also have the benefit of being completely natural. Kasson, whose research is funded by the U.S. Department of Agriculture Forest Service, believes it would be relatively simple to develop a soil granular to spread on top of poison ivy-infested areas in yards and recreational areas such as campgrounds to naturally infect the plants and kill them. After Kasson successfully isolated the fungus in pure culture from infected plants, a DNA analysis revealed that the fungus—Colletotrichum fioriniae—is also widely known as an insect pathogen that kills an invasive bug that infests and kills hemlock trees. In all of the natural world, only humans are allergic to poison ivy and its itch-inducing oil, urushiol. Jelesko and Kasson have filed for a patent disclosure of their current findings, and say that this research just scratches the surface of possible avenues for the study of poison ivy. With the summertime, comes increased outdoor activity, as well as increased exposure to things such as poison ivy and bug bites. 1. Knowing how to identify the plant – poison ivy has a cluster of three leaves at the end of a long stem. Hairy vines that you often see growing up the side of trees are also poison ivy. 2. Wearing gloves, long sleeves and pants if you are working outside, and washing them immediately after use. Bug bites can also be quite the nuisance, and in some cases, quite dangerous. Tick bites, in particular, can cause serious health conditions such as Rocky Mountain spotted fever and Lyme disease. To prevent tick bites, wear bug repellent spray containing at least 25 percent DEET when spending time outdoors. In most cases, bug bites and poison ivy rashes can be treated at home using cold compresses and/or hydrocortisone cream to help with the itching. However, if a rash from poison ivy lasts more than three weeks or if you begin experiencing high fever, achiness, a rash, fatigue and/or headache within a month of a tick bite, you need to seek medical attention. Fortunately, Cone Health has an exceptional network of urgent care facilities throughout the area, from Kernersville to Mebane, dedicated to providing proper treatment to patients who have experienced a common summertime injury or health condition. Dr. Laura Murray is an urgent care specialist at Mebane Urgent Care at Mebane Medical Park. Dr. Murray received her Doctor of Medicine from the University of North Carolina at Chapel Hill School of Medicine in 1994. She completed her residency in internal medicine at The Ohio State University Department of Internal Medicine in 1997. Plants are waking up and seedlings emerging. Runners are creeping across yards and woodlands, over fences and walls. Ropelike aerial roots are shooting up the sides of trees like archers to a target. It’s spread by birds, which eat the seeds. Development and habitat destruction, and our own gardening habits, are factors, too, Mycka says. We build homes and attract birds that like to eat from feeders, explore our gardens, and perch on our decks, buildings, and fences. Duke University researchers have also determined that rising carbon dioxide levels are causing poison ivy to grow faster and produce more potent urushiol, the pale, resin-like substance that causes the plant’s signature rash, swelling, and blistering. That was not the case with Gusoff, a retired public schoolteacher who loves to garden and tried for two years, unsuccessfully, to get rid of her poison ivy. Gusoff, who suffers from multiple sclerosis and other ailments and walks with a cane, became so overwhelmed by “the monster” quietly infiltrating her yard that she avoided the family’s aboveground pool for two summers. “She enjoys exploring the backyard. It’s a jungle out there,” says Gusoff, who finally called Mycka. One day in late April, he arrives with a crew of three. They’re wearing long sleeves, long pants, double gloves, and wrist-to-elbow Tyvek protectors, knee pads, and boots. Using Japanese gardening knives and serrated grass sickles with hardened steel blades, the men follow the vines 15 feet down the trunk to the base of a 30-year-old white spruce, and out into the yard. “It doesn’t matter if you start above or on the ground, as long as you get it all,” says Mycka, who estimates that Gusoff’s vine is nine years old, 19 feet long, and 25 pounds. In 2013, Mycka used crowbars to pry a 50-foot poison ivy vine off a hackberry tree along Kelly Drive in Fairmount Park. Counting rings, he determined that the female vine – yes, there are male and female plants – was 38 years old. Cut into five pieces, it tipped the scales at 506 pounds. “This is an interesting job,” says Mycka, who collects poison ivy books and art in his Overbrook home. He grew up in the city’s Somerton section, always wanted to be a gardener, and became fascinated by toxic plants when he was a Boy Scout. He signed on at the zoo in 1974 and, after seven years of evening classes, earned a two-year associate’s degree in horticulture from Temple University Ambler. Poisonous in every season, poison ivy doesn’t die in winter. Bird-dropped seeds can germinate and wind up climbing a tree 15 feet away. In three years, that vine can be 25 feet up the trunk. In 40 years, just imagine. If you’re lucky, you’re among the 15 percent of the population whose immune systems don’t register poison ivy as a threat. Mycka’s crew is among them, but he is not. Yes, the boss occasionally gets the rash. But, as you might imagine, he is very, very careful. So careful that when a now poison-ivy-free Gusoff approaches to shake his hand, Mycka backs off. “We’ll do a virtual handshake,” he says. “God bless you,” his grateful client responds from two feet away. What does moss feel like? Have you ever touched it? We all know the rhyme “leaves of three, let it be” to identify poison ivy. But did you know that poison ivy can also look like a thick, hairy rope? The nearly 400 native and invasive species that grow at Island Beach State Park will be explored during a free program for children and families taking place the next two weekends. Join Samantha Kuntz, an intern with Save Barnegat Bay and a sophomore at Georgian Court University, at the Interpretive Center at Island Beach on Saturdays and Sundays (May 10, May 11, May 17, and 18) at 10:30 a.m. for a free family-friendly talk about the different species using the Emily deCamp Herbarium, a hands-on activity dissecting flowers, and a walk from the bay to the ocean to identify plant communities. See if you can spot the red cedar, bayberry, high bush blueberry, pitch pine, beach plum, American beach grass and Japanese sedge. The 45-minute program is perfect for children ages 5 and up and their families and is available to the first 20 children. What’s a herbarium? It is a collection of preserved plants which are annotated for scientific and public study in a filed taxonomic system. The first herbarium dates back to 1578 when a count in Italy established the national herbarium. Presently, there is a functional national herbarium in every nation in the world. In the United States, the Smithsonian Institution in Washington, D.C. houses about 1.8 million mounted plant specimens from all over the world. Kuntz, 26, a Toms River resident and biology/pre-med major who hopes to continue her education to become a dentist, said she will talk about grasses, shrubs, trees and plants that are specific to Island Beach. “I’ll be exploring plant evolution, starting with algae, then the mosses and ferns, to the pitch pine. All are considered angiosperms,” she said, rattling off the names of common angiosperms that can be found at Island Beach, including Poison Ivy, Seaside Goldenrod, Beach Plum, Red Cedar, Bayberry and High Bush Blueberry. Kuntz said she will also show children how to dissect a flower and point out the petals, stamen, stigma, stems and leaves that make up a flower and lead a nature walk to find some of the native flora. The herbarium and Janet’s Garden at Island Beach State Park originated through the support of the deCamp family and friends. It consists of over 400 native and introduced plants found on the barrier beach island. The individual specimens are mounted in glass or plastic-modified Riker mounts, which are presented in a humidity-controlled cabinet under a nine-color coded cross section showing the various plant communities at Island Beach. Key identifying information is printed on the front of the mount together with the dried plant specimen. The back of the mount has pertinent scientific and general interest information. This is one of the few herbaria, which is open to the public and allows the individual plants to be handled by park visitors.